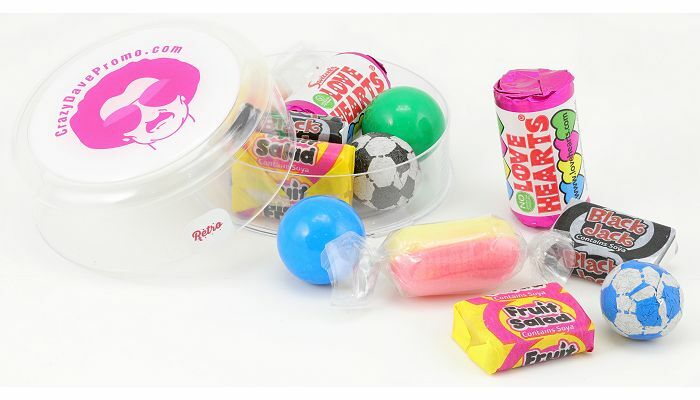 Branded Retro Sweets logo printed promotional items. 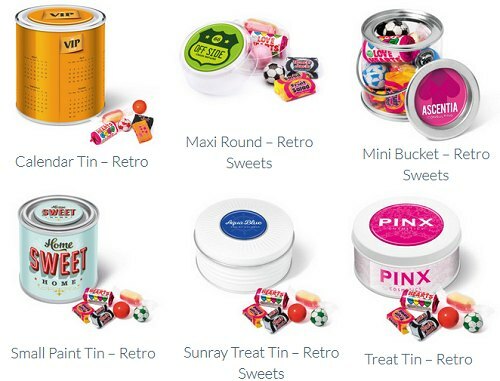 Here's our selection branded retro sweets with logo printed wrappers and container lids for promotional gifts. Our promotional retro sweets are available in these logo printed containers: Organza Bag · Bus Tin · Calendar Tin · Candy Bags 100g · Candy Bags 60g · Maxi Bucket · Midi Bucket · Mini Bucket · Maxi Round Pot · Small Paint Tin · Sunray Treat Tin Sweets · Swing Tag Bag · Treat Tin. Depending on the particular product you can have Love heart rolls, Refreshers, Rhubarb & Custard Boiled sweet, Gobstoppers, Chocolate footballs, Flying Saucers, Fruit Salads and Black Jacks.